Sour beer has hit the craft beer scene like a tidal wave of bacteria-induced, funky tart goodness. Although the style of beer is nowhere near a new idea - Belgian lambic ales have been around since 1794 - the craft brewers of today are trying their hand at the art of sour beer with some great results! This delicious sour rocketed into the spotlight in 2016 when it was named the “Beer of the Year” at the Canadian Brewing Awards. The huge demand for this means we are only able to get our hands on it a couple of times per year now, so it’s best to strike while the iron is hot! This kettle sour clocks in at 5.5% alcohol, with juicy notes of peach, nectarine and passionfruit that sit atop the tart sour kick. A healthy dose of galaxy hops adds an extra layer of depth and complexity. This is without question one of the best sour beers in Canada. Try it while you can! Those of us here at Vine Arts have been long-awaiting the triumphant return of this little beer. Rodenbach Grand Cru is the most traditional option in the line up and is widely agreed to be an ideal example of a Flanders Red Ale. It’s bright notes of balsamic and malt vinegars, snappy cherry skins and ripe plums are softened by up to 3 years of oak-aging, giving Grand Cru a slight vinous quality that makes it the ideal companion to grilled meats. 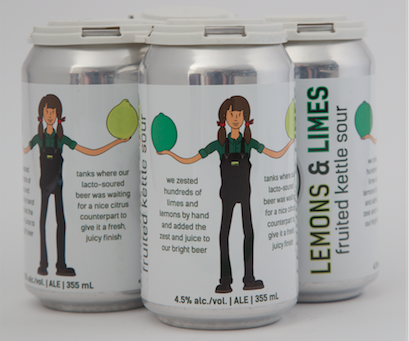 Lemons & Limes is only available during the summer months and is brewed with hand squeezed juice and power-drill assisted zest, videos exist for the sceptics out there! Check out the process here. The Dry-Hopped Kettle Sour is available year round but the constantly changing strains of hops used to flavour the beer keep things fresh and interesting. Both are fabulous options for your easy-drinking, thirst-quenching beer needs, and on regular rotation at both locations! Okay so this one is kind of a cheat, since it’s not technically a soured ale. But, thanks to the passion fruit’s natural tartness, it comes across that way. Parklife is a patio favourite and oh-so crushable coming in at just 4.5% ABV. Even the colourful label artwork screams “summer!”.